Denise DiPaolo always wanted to run a business of her own that combined food and people. She waited a number of years and worked her way through a variety of jobs (including stints as a community organizer and an educator) before she finally opened the doors of the Ristorante DiPaolo in Turner’s Falls, Massachusetts. 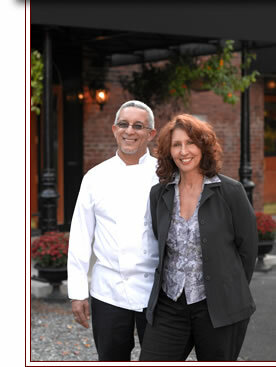 The restaurant opened in March 2006 as a partnership between Denise and Chef Hilton Dottin. Born in the Dominican Republic, Hilton went to restaurant school in New York and became an American citizen. He and Denise planned a menu that would draw on all regions of Italy, spiced up a little by Hilton Dottin’s Caribbean roots. Within a year the restaurant became a destination for food lovers in western Massachusetts. On a fall afternoon I joined Hilton in the restaurant’s compact but well laid out kitchen to watch him prepare one of his specialties, cannellini bean soup. The soup as he prepares it takes a while to make, but it’s a substantial dish that warms the kitchen and creates mouth-watering odors. On the day on which I visited, the chef happened to have a small winter squash on hand so he cooked its pulp in the bean water and pulverized it in a blender with a little broth after it softened, adding it eventually to the final product. He also added a few extra pieces of Prosciutto and uncooked bacon to the pancetta in the recipe for extra flavor. He explained that he often varies a recipe, which he views as a guide. “When I follow a recipe in a book, I usually make it the way the book says, and then I add to it the next time,” he noted. Watching Hilton chop, stir, and taste was inspiring. He stressed getting the freshest ingredients possible and looking for organic produce whenever possible. Nevertheless, he admitted that economy and availability of foods force him to be practical in his shopping. If dried cannellini beans for this soup are hard to find, for example, he suggested substituting white navy beans. Hilton didn’t need much help from me in the kitchen. I skinned a few tomatoes for him, but he managed to peel more than 20 in the time it took me to do three. I received some of the rewards of participation in the cooking process, however. When I got home, my family told me that the soup “perfume” I had acquired in the kitchen of the restaurant was tantalizing—a mixture of garlic, vegetables, pancetta, and love. I also left with a little care package of the soup, which was everything soup should be. It tasted warm and hearty, complex yet perfectly blended. Best of all, Hilton shared his recipe with me. We’re not in fall anymore, of course, so when I made it recently I used canned tomatoes. (Sorry, Hilton!) I also used canned beans because we had them in the house. I’m giving you the recipe as I prepared it because it was quick (no soaking of beans overnight) and ALMOST as tasty as the original version. If you want that one, do visit the Ristorante DiPaolo. Preheat the oven to 350 degrees. Drizzle the tomatoes with a little olive oil, and sprinkle them lightly with salt and pepper. Roast them until they smell good—about 20 minutes. In a 4-quart Dutch oven sauté the pancetta in the olive oil over medium heat for 5 minutes. Stir constantly. Add the cumin, oregano, onion, garlic, celery, and carrot. Sauté until the onion pieces become translucent, 5 to 10 minutes. Add the roasted tomatoes and continue to sauté for 3 more minutes. Add the beans and the chicken stock. Bring the soup to a boil. 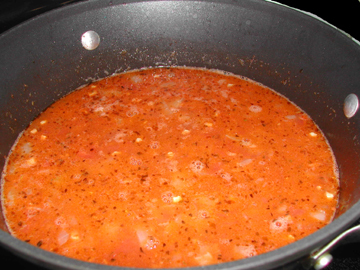 When it boils reduce the heat, cover the soup ALMOST completely, and simmer it for 20 minutes. This entry was posted on Saturday, March 6th, 2010 at 4:00 am	and is filed under Soups and Stews. You can follow any responses to this entry through the RSS 2.0 feed. You can leave a response, or trackback from your own site. Sounds fantastic! Italian food spice up Caribbean-style is a favorite in our house. Okay, this is a must try. Anything that has pancetta as an ingredient is irresistible to me. It looks fantastic! I can hardly wait to try it. This looks good….and healthy and hearty. One of the filling foods that is acually good for you! I’m going to try it. Tinky, you’ve done another fine post! The restaurant has been the scene of some of our most pleasant dining experiences. 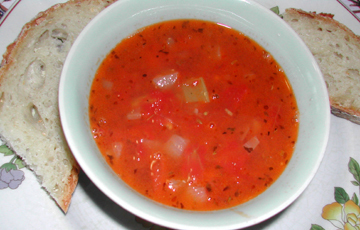 And the photographs you’ve included are gorgeous – they convey the intense essence of tomatoes in a splendid soup. When your prose and images make us salivate, you’ve done a fine job of food writing. Today is turning out to be the perfect day to try this recipe. Many thanks!